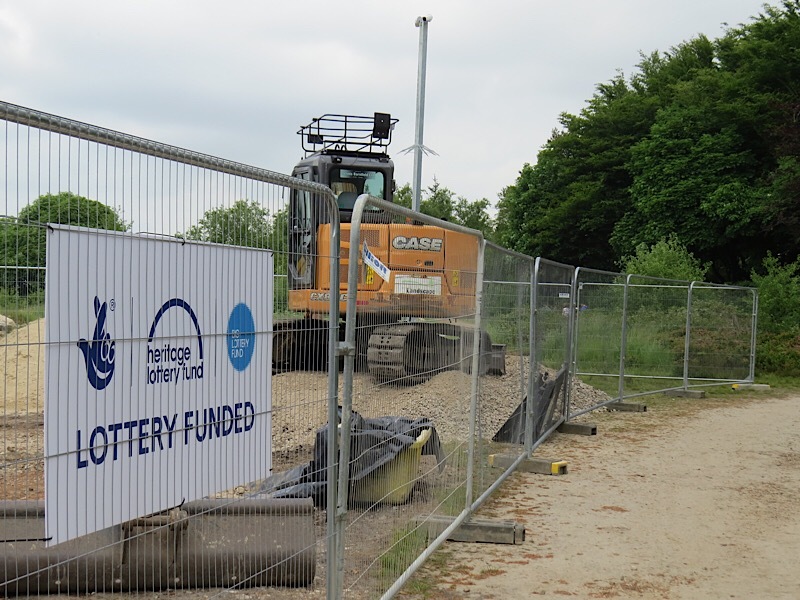 Working for the schemes main contractor HPR Ltd , Landscape Engineering have commenced work on the pond dredging, path works and associated stone work renovation. We will be keeping you posted with photographs as works progress via our twitter feed @LandEngLtd so be sure to like and follow to keep up to speed. 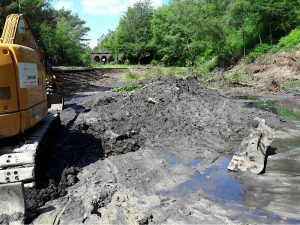 Dredging the ponds and sifting through what might be in the silt is quite a challenge but the transformation will be huge. We include an item from Groundwork CLM, the project managers, below. This gives a summary of the work and the process they have gone through to make it happen. Rivington Terraced Gardens were originally created for soap magnate Lord Leverhulme as a spectacular venue for him to relax in and entertain. Situated on the hillside below Rivington Pike, the Gardens were designed by noted landscape designer Thomas Mawson between 1905-1922. His vision created a dramatic hillside garden, featuring a heavily-wooded area including a network of footpaths that provide the terraces that give the Terraced Gardens their name. There’s a man-made ravine and cascade, with several bridges and fords crossing it. The upper section of the park contains the remains of the formal lawns and gardens which surrounded Lord Leverhulme’s residences. These include a Japanese Garden and lake, an Italian Garden and lake, and the former Orchestra Lawn. The park contains many dramatic stone-built structures, including a magnificent 7-arched bridge, a number of Summer Houses and Viewing Platforms, and the haunting building known as the Pigeon Tower. Today, the original structure of the Gardens remains but ornamental planting has been replaced by woodland. It’s a magical place of winding footpaths and unexpected surprises, much loved by local people and visitors from across the region. The Gardens are an incredibly significant, culturally valuable piece of landscape. It is unique within the region, as a hillside garden of such scale, and it has national significance derived from its designer, Thomas Mawson. We have successfully secured £3.4Million in funding from the Heritage Lottery Fund as part of a £4million restoration package supported by United Utilities, the Country Houses Foundation and others to conserve and revitalise Rivington Terraced Gardens. Our focus is on stabilising and consolidating existing decaying structures within the Gardens, so that they can be enjoyed by generations to come. We will improve access both to and around the Gardens so that more people can visit. We won’t be trying to restore the Gardens to their original plans – this would be far too costly both to create and maintain. People have also grown to enjoy the Gardens in their current wooded state. We want to make sure the structures can be safeguarded, and carry out work to allow the spirit of Mawson’s original design to remain within the current context. We have undertaken a wholesale review and improvement of the cataloguing and interpretation of the site’s landscape and heritage. The improvements to the Gardens will enable them to be better managed in the future, safeguarding heritage for generations to come. A programme of skills development and volunteering will capitalise on the park’s unique and diverse features and establish it as a living and vibrant resource for local people to become involved and improve their skills. The plans are being driven forward by a partnership of the Rivington Heritage Trust, Groundwork Cheshire Lancashire and Merseyside and United Utilities. Guided walks and conservation tasks take place each month, as well as regular corporate volunteering days. In addition to this, the team have begun to deliver a series of events for the wider public. You can read more about the project on the Rivington Heritage Trust website. Please support the project as it will help preserve the gardens for many years to come.